It was a chilly December night when I settled into my seat at St. George’s Church (Georgenkirche) in Eisenach, Germany for the sold-out Johann Sebastian Bach Weihnachts Oratorium. By this time, my press trip through the central German state of Thuringia had ended, but my affable guide Cornelia insisted I take part in this cherished holiday tradition she and her husband attend annually. Bundled from head to toe in my best excuse for winter wear—I’m a South Florida native—I listened as cheerful compositions sprang from the choir loft overhead and watched as the crowd drifted into tranquility, before finding myself feeling perfectly at home and at peace. Discerning travelers are seeking authentic, engaging, and deeply emotional experiences such as these, which can be a tough order to fill when visiting popular tourist destinations…but it’s easy to find when exploring little-known gems like Thuringia. One of the greatest ties to a person’s home is undoubtedly food. For Thuringians, bratwurst is not only a celebrated regional dish, it is practically a way of life. The history of this succulent grilled sausage is cataloged at the first German Bratwurst Museum in Holzhausen just outside the capital city of Erfurt. A satisfying staple food, the first recorded mention of bratwurst dates back to an entry made in the housekeeping accounts of the Convent of the Virgins in 1404. In the museum, exhibits provide guests with information on the sausage from pig through slaughter, including the ingredients, butcher’s equipment and apparatuses used in sausage production. I tried my hand at making the sausage at the museum’s neighboring restaurant, grinding the meat mixture and stuffing it into its fine casing. Afterwards, the staff joined us for authentic, freshly grilled Thuringian sausages. In addition to making their own Thuringian bratwurst, your clients can visit the museum’s bratwurst theater for dinner and an interactive, comedic performance. If bratwurst is considered king, roasted duck is figuratively queen. Traditionally served alongside red cabbage it is a must-eat local favorite in Thuringia. Don’t suggest, implore your clients dine on this dish and others at the restaurant inside the colorful Boutique Hotel Schieferhof in Neuhaus am Rennweg, located about an hour-and-a-half drive due south of Erfurt. This 100-year-old property, which seems plucked from the pages of an L. Frank Baum novel, features 38 guestrooms that each display their own individual charm, from the Fairy Tale Room with its working miniature carousel and pop art paintings inspired by Andy Warhol, to the Reading Room with its cheetah print lamp shades, plaid carpeting, and wallpaper featuring pages from Heinz Stade’s “Unterwegs zu Schiller.” True to form, my Thuringian Forest Stars dinner at the Boutique Hotel Schieferhof was just as quirky as the bare-bottomed imp holding my butter knife. Each course revealed a new gastronomic delight, ending in a grand finale of gingerbread ice cream and tipsy berries with a white chocolate sauce. Just up the street from the Boutique Hotel Schieferhof is the Der Christbaum factory, where Ines and her husband Willi, a sixth generation glass blower, create delicate bulbs, bells, tree toppers and hand-painted replicas of original Lauscha Christmas tree decorations year-round. If your clients are lucky, Ines will invite them into the back of the shop for an intimate glassblowing demonstration. Surrounded by multicolored glass rods and simple tools, I watched as Willi transformed a simple white tube into a male deer, gently blowing into a plastic pipe, manipulating one glass rod with another over a small burner, until his creation was complete. Later, I went farther back into the shop, where Ines showed me the painting process. Chatting like old friends, she shared the significance of some of the decorations and her family’s history. At the German Toy Museum in Sonneberg, located a half-hour south from Neuhaus am Rennweg, your clients will have to employ suspension of disbelief in order to imagine themselves at the 1910 World’s Fair in Brussels, where German toymakers unveiled an exhibit unlike anything the world had ever seen. Instead of bringing pamphlets describing the intricate creations made in the then toy capital of the world, the town exhibited the now famous “Thuringian Fairground” complete with 67 almost life-size figures, including a ballerina on a horse, an African drummer, clowns, a working carousel, street vendors, children, buildings and animals. As the lights in the exhibit room flickered on, I sat in awe as the sights and sounds of this depiction of a typical country fair came to life. 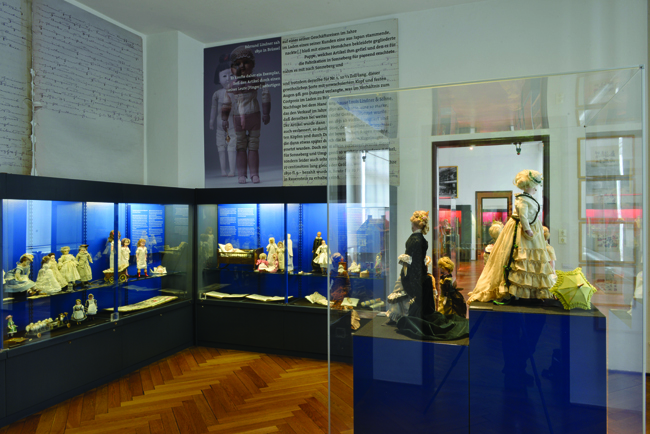 An infinite number of toys are on display inside the museum, featuring Germany’s oldest toy collection. Many of the pieces are original and rare, including Victorian dolls, wooden boats and toy trains, hailing from around the world and throughout time. Meanwhile, the Saalfeld Fairy Grottoes, located an hour north of Sonneberg at the edge of the Thuringian Forest, showcase another perspective on what life was once like in Thuringia when miners worked in the caves some 500 years ago. Declared the “most colorful cave grottoes in the world” by the Guinness Book of World Records, poor yields halted production in 1850 and the complex was abandoned, giving way for nature to work her magic. The Saalfeld Fairy Grottoes were re-discovered by explorers in 1913, who named it the fairy grottoes because they thought the stalactites and stalagmites that grew from its abandonment looked like a fairy’s hair. For a tour of the grottoes and a glimpse into this bygone era while visiting the nature discovery park, your clients can don a cape and mining hat, just as I did. After all, experiential travel is a state of mind; to feel like a local you must pretend to be one.